Every day, thousands of planning applications are submitted to local councils around the country by people applying to demolish a garage, erect a fence or convert a loft. More often than not these applications disappear into proprietary systems that, despite being publicly available, make it hard for members of the public to find out what’s going on in their area. 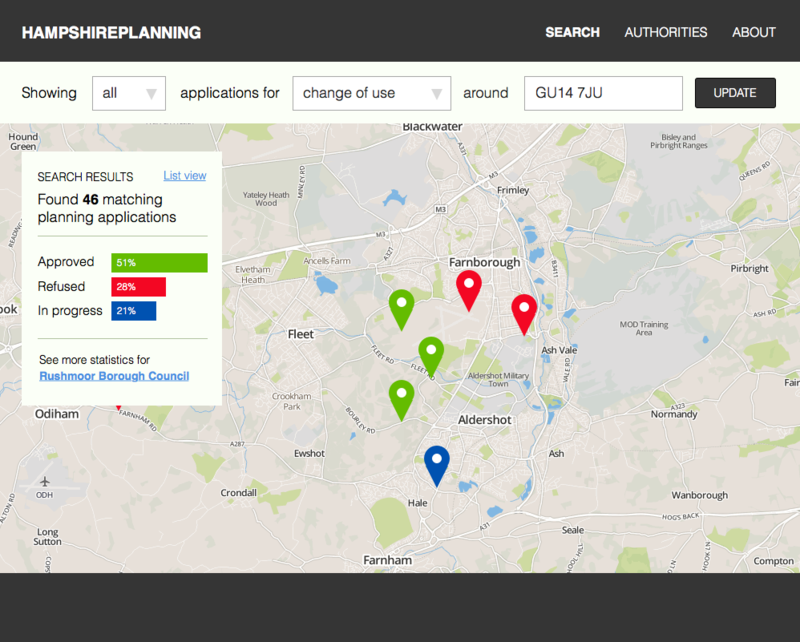 Last week, we kicked off the first sprint of an exciting new piece of work with the Hampshire Hub Partnership to build a prototype, open source web application to help members of the public find out more about planning applications in their area. We jumped at the chance to work on this for a number of reasons. Firstly, it has the needs of the general public as its focus. The planning process can be baffling if you’re new to it and this tool aims to help make it easier to understand. We’ll be helping people answer some of the most common questions they have about planning applications: What applications are happening near me? What decisions have been made in the past on applications like mine? How likely is it that my application will be dealt with on time? The site will help people browse planning application data by location — whether a postcode or a street address — and by type — whether it’s an extension, a loft conversion, or a major development like a retail park or commercial warehouse. Secondly, it’s being made possible by the release of open data from local councils, once Ordnance Survey has granted the necessary exemption for locations derived from their data. Many of our projects rely on organisations publishing open data, so it’s great to have the chance to help demonstrate the value of releasing this kind of data openly. The Hampshire Hub team has already spent a lot of time working with the LGA, DCLG and LeGSB to define a schema for how planning application data should be published. They’ve collaborated with local authorities, in particular Rushmoor Borough Council, to gather planning application data. And they’ve worked with Swirrl to set up an open data platform to collect all of this together, publish it openly and give us and others access to it. And finally, rather than build something from scratch, we’ll be using the fabulous PlanningAlerts.org.au open source codebase as a starting point. Planning Alerts is a piece of software built in Ruby on Rails by our friends down under at Open Australia. It gives us a lot of the functionality that we need for free. We plan in time to repay them for their kindness by submitting the features we develop back into their codebase (if they want them, of course). We’ve just started our second sprint of work atop the Open Australia codebase, building the search functionality we need to help people find applications by location and category. We’re looking forward to seeing the tool grow, get into the hands of users and fill up with data. FixMyTransport is the most challenging project mySociety has ever tried to build. It’s so ambitious that we’re taking the unusual move of breaking off part of the problem and stress-testing it in the form of the new mini-site Brief Encounters, which has gone live today. It was built by Louise Crow, or Crowbot, as we know her, with design support from Dave Whiteland. Brief Encounters is not, as the name might suggest, mySociety’s long awaited attempt at a dating site. Instead it’s a place where people can share whimsical stories about unusual things that happened them them, or other people, on public transport. We hope you’ll have a go, read some examples and then contribute your own. You might be thinking that a whimsical story site doesn’t sound very mySocietyish – and you’d be right. Brief Encounters is actually a technology test-bed to help us crack a new design and data problem: how do you make it as easy as possible for users to pinpoint a specific bus stop, or train route, or a ferry port, as easily as possible? There are over 300,000 such beasties, and nobody has ever really tried to build an interface that makes it easy to find each one quickly and reliably. Feedback on the user experience – how can we make finding a route or node easier? 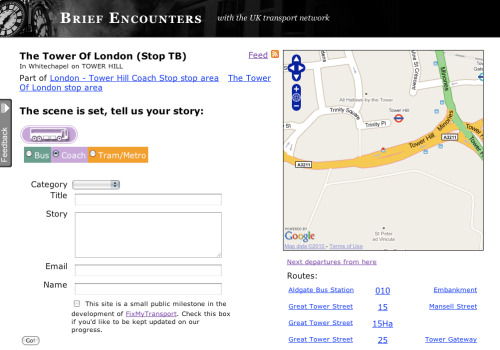 For those of you tech minded, the project is built in Ruby and uses the NaPTAN dataset of stations, bus stops and ferry terminals, the National Public Transport Gazetteer database of towns and settlements in the UK, and the National Public Transport Data Repository of sample public transport journeys, from 2008. The first two datasets are free of charge, and the third one mySociety pays for. Lastly, kudos must go to the hyper-imaginative Nicky Getgood who suggested we collect stories on FixMyTransport, as well as problem reports. WhatDoTheyKnow keeps growing and growing, sucking people in from Google as its archive of maybe 8.5% of Freedom of Information requests gets more and more detailed. There’s round about 8Gb of unfettered Government data in the core database, plus a whole bunch more for indexing and caching. For comparison, TheyWorkForYou (which now goes back to 1935) has 12Gb. And it’s catching up on traffic also – WhatDoTheyKnow has about half the number of visitors as TheyWorkForYou. When WhatDoTheyKnow started failing, we did the obvious things to start with – moving the database to a separate server, and moving some other services off the same server, to give WDTK more room to breathe. It still kept breaking. None of my server monitoring tools shed any very clear light as to the problem. I upgraded to the latest version of Passenger, the best Rails deployment tool I’ve seen yet. It’s pretty good, but still not mature enough for my liking. I was still getting the same problems with it, but reporting tools like passenger-memory-stats were really helpful. I found some Rails processes were getting jammed, and not dieing even when I restarted Apache. I think in the end this was due to the Passenger spawning method, and our use of the Xapian Ruby module. Running Passenger in RailsSpawnMethod conservative mode made things much more robust. if memory > 3500 MB then exec "/usr/sbin/apache2ctl graceful"
I found memory_profiler on a blog. It helps you find the kind of memory leak where you unintentionally continue to reference an object you don’t use any more. With a specialist subject of string objects. This led to a fix to do with declaring static arrays in classes vs. modules, which I still don’t really understand. But it wasn’t the cause of the big 1Gb memory munching, there were no large enough leaks of this sort. The record_memory function in WDTK’s application controller came from another blog. It’s handy as it shows you how much of the system memory in the Ruby process each request causes an increase by. With caveats, this was the best way for me to identify the most damaging requests (search results, and certain public body pages). And it also brought focus on the actual problem – the peak memory use during a request. That’s really important, because Ruby’s memory manager never returns memory to the operating system… The Gb leaps in memory use were because of temporary memory used during certain requests, which the Ruby memory manager then never frees later. I made a bunch of functions culminating in allocated_string_size_around_gc. This was really useful in use with the “just add lots of print statements and fiddle” school of debugging. Not everyone’s favourite school, but if your test code can’t catch it, one I often end up using (it gets really involved rarely enough that it doesn’t seem worth setting up an interactive debugger). It led me to various peak memory savings, such as calling “text.gsub!” rather than “text = text.gsub” while removing (email addresses and private information) from FOI request responses, which help quite a bit when dealing with multi-megabyte attachments. Finally, I used the overlooked debugging tool, and the one you should never rely on, being common sense. That is, common sense informed by days of careful use of all the other tools. In order to quickly show text extracts when searching, WDTK stores the extracted attachment text in the database. A few of these attachments are quite large, and led to 50Mb fields, often several of which were being loaded and processed in one page request. That this would cause a high peak of memory use all became just obvious to me some time yesterday. I checked that that was the case, and this morning, I changed it to use the full text for indexing, but to at most keep 1Mb for use in snippets. So sometimes now you won’t get a good search extract for queries, but it is rare, and it will at least still return the right result. I’ve more work to do, I think there are quite a few other quick wins, all of which are making the site faster too. I’m quite happy that WhatDoTheyKnow also has a bunch more test code as a result of all this. One of the special pieces of magic in TheyWorkForYou is its email alerts, sending you mail whenever an MP says a word you care about in Parliament. Lots of sites these days have RSS, and lots have search, but surprisingly few offer search based email alerts. My Mum trades shares on the Internet, setting it to automatically buy and sell at threshold values. But she doesn’t have an RSS reader. So, it’s important to have email alerts. So naturally, when we made WhatDoTheyKnow, search and search based email alerts were pretty high up the list, to help people find new, interesting Freedom of Information requests. To implement this, I started out using acts_as_solr, which is a Ruby on Rails plugin for Solr, which is a REST based layer on top of the search engine Lucene. I found acts_as_solr all just that bit too complicated. Particularly, when a feature (such as spelling correction) was missing, there were too many layers and too much XML for me to work out how to fix it. And I had lots of nasty code to make indexing offline – something I needed, as I want to safely store emails when they arrive, but then do the risky indexing of PDFs and Word documents later. The last straw was when I found that acts_as_solr didn’t have collapsing (analogous to GROUP BY in SQL). So I decided to bite the bullet and implement my own acts_as_xapian. Luckily there were already Xapian Ruby bindings, and also the fabulous Xapian email list to help me out, and it only took a day or two to write it and deploy it on the live site. If you’re using Rails and need full text search, I recommend you have a look at acts_as_xapian. It’s easy to use, and has a diverse set of features. You can watch a video of me talking about WhatDoTheyKnow and acts_as_xapian at the London Ruby User Group, last Monday. On our servers we only install software from Debian packages, or our own software with install scripts from our own CVS. This at first seems a bit mad, especially to Ruby on Rails people who love their gems. But it’s a sane way of managing lots of servers (we’ve got 7 Debian servers, and 2 FreeBSD servers to run at the moment). Of course, you could install packages on them from CPAN, from Ruby Gems, by compiling them yourself and putting them in /usr/local. But you’d have to have another system for each packages system to keep track of what you’d installed and what version, and to worry about security updates. And you’d lose some of the benefits of dependency checking. Most of our servers are, inevitably, still running Debian Sarge (the latest and greatest when we started them a few years ago). We’re going to gradually upgrade them to Debian Etch, but it is going to take a while. In the fast moving world of Rails this isn’t particularly helpful, so you have to backport packages. I couldn’t find any, so have made some myself.